This film was not very good. It would have been okay as a made for television movie but the Wachowski Siblings really missed the mark with this one, which is a shame as “Cloud Atlas” was so amazing. There are a lot of reasons this film didn’t work, but for me the biggest problem is Jupiter is an extremely passive protagonist, the majority of the film is her getting saved so there is no point to her being the title character as Caine is the one doing all the action and in the end driving the plot, Jupiter is nothing more than a Space McGuffin and it’s really annoying. The film was directed by the Wachowskis who also produced and wrote it, and the other producer was Grant Hill. The story involves Jupiter (Mila Kunis) who is the reincarnation of the Queen of the most powerful family in the Universe. From here the story unfolds as she realizes her power and works with Caine (Channing Tatum) to stop her mother’s children of House Abrasax from taking her title and destroying the Earth. The Pros: The Special Effects – The Special Effects are pretty cool and there was clearly a lot of creativity put into the alien and ship design, it’s a shame that same passion wasn’t given to the writing or the actors. This is one of the few pros of the film, it does look good. Stinger – Sean Bean plays a character who doesn’t die! He is who Caine goes to for help as Stinger had stood up for him when Caine had gone feral as they are both hybrids. Stinger is half-bee so it means he was able to fly at one point (that feels so weird to write). His character works to protect his daughter and he betrays Jupiter at one point to get the cure for her, though of course he joins the final battle to help Caine save the day. The Cons: The Characters – Besides Stinger no one had motivations that felt real, they all felt overly convoluted and not fully fleshed out. I didn’t understand why Caine was all wound up and why he was working for one of the Abrasax family members and Jupiter was just passive and obsessed with a telescope because her dad had been, that is her single character trait. The Braxis are all selfish kids with Mommy issues and the good characters are just there to drive the plot. It’s sad how much potential was lost here with this world, since it’s an original Space Opera, I wanted to like it. 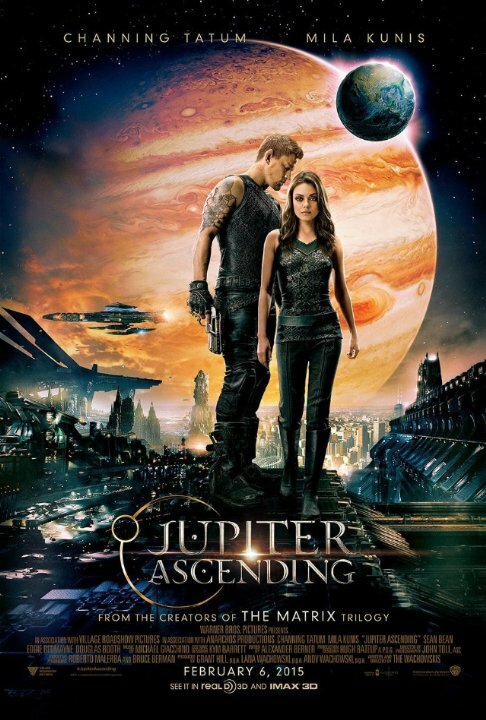 Passive McGuffin Jupiter – Jupiter is saved nearly 3 times in the first 20 minutes of the film, the rest of the film is Caine getting her out of more situations since she is the McGuffin of the plot as her blood can protect the Earth. She does nothing on her own and all choices are forced on her, I hated it. She is special because of her blood since she is the reincarnation of the Mother of Abrasax and the heir but she does nothing with that power, everyone else tries to use that power which made me wonder why we just didn’t get the film from their perspective. Mila Kunis’s acting doesn’t help as she sounds bored or helpless the entire time. The Action – Sometimes the action looks like it’s from a Michael Bay film, the camera pans and in unfocused so it is hard to know fully what’s going on except Caine is fighting some baddie and Jupiter needs to be saved, again. House Abrasax – So they make money harvesting people to prolong life is what they are all about and they use other aliens as labor but there is never any reason for the aliens to follow them, the only ones we see using the the Human Fountain of Youth are Humans so there isn’t really any point to the other aliens being around or for them to follow House Abrasax. Also the sibling rivalry felt contrived and Eddie Redmayne’s character was really bad, he could have hammed it up so much more but he was just tired and weird. If you are looking for good original Sci. Fi. films like I was, don’t look here. A movie needs more than special effects to carry it and if you are going to name your movie after the title character, have her actually do something besides being rescued every 10 minutes. Suffice to say, I was not impressed with this film and do not recommend it at all. This is a very great leap down from “Cloud Atlas” and I hope the Wachowskis don’t have this be their final film, or they will be ending their legacy on a very poor note.